Empanadas are a popular traditional food that is not only delicious but also easy to eat on the go. As you walk through the city streets you will be sure to find these savory bites in almost every restaurant, and pizza parlor. The fillings vary as does the dough, they may come baked or fried, and each is characterized by their own special “repulgue” (the sealing of the dough). The typical fillings you are likely to find in most places in include meat (made from ground beef, or meat cubes, spicy or mild), chicken, corn and béchamel (humita), ham and cheese and onion and cheese. Other variations are usually served in specialized empanada houses and may include bacon and plum, caprese, and pumpkin to name a few. Defined by their slogan which reads “Eating is a biological action, eating at El Sanjuanino is a cultural one,” this regional restaurant offers top quality empanadas in a cozy traditional setting. Their empanadas contain mild meat, spicy meat, ham and cheese, corn, chicken, vegetable, mozzarella, tomato and basil and Roquefort fillings. Another traditional restaurant that offers a larger variety of empanadas and has a unique setting decorated with retro toys, advertising and games from the 50’s-80’s. They offer mild meat, spicy meat, chicken, tuna, ham and cheese, plum and bacon, chard, Roquefort and celery amongst others. Owned by legend folk singer Mercedes Sosas family, this regional restaurant offers Tucuman style empanadas characterized by being made of chopped meat, potatoes and various spices including cumin amongst others. This recycled house in Palermo serves pizza and a very large variety of empanadas including both traditional and unique fillings. Their menu includes empandas filled with red bell peppers and ham, eggplant, and anchovies amongst others. 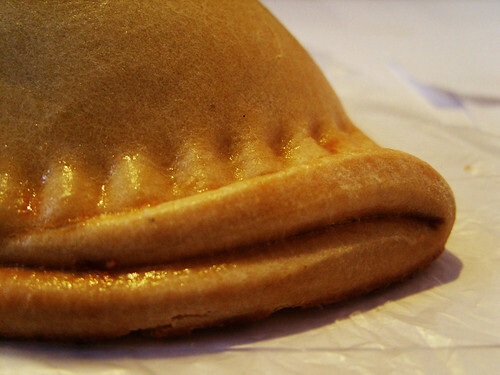 A traditional restaurant that specialize both in regional empanadas and in one of a kind varieties, which they claim, are the best in Buenos Aires. What can you find here? A 7 cheese + Roquefort variety, an 8 vegetables kind, and an oversized Italian empanada filled with everything from pepperoni to olives to red bell pepper. If you would like to make your own empanadas don’t miss on one of these great cooking classes. This entry was posted in Food & Drink and tagged argentina, buenos aires,, empandas, Food, recommendations, traditional food by Fierro Hotel Staff. Bookmark the permalink.